This luxury one bedroom condo is located on Simpson Bay Lagoon in the AquaMarina Community. The condo is 862 square feet (80 square meters) with 2 balconies. There are beautiful water views (Atlantic Ocean, Caribbean Sea and Simpson Bay Lagoon) from all rooms. The stunning views include Simpson Bay on the Dutch side as well as Sandy Bay and Marigot on the French side and the island of Anguilla off the coast. The condo is ideal for a couple who want to enjoy a romantic get away in a beautiful location. The condo has all the comforts of home with a fully equipped kitchen, living room, dining room, laundry and one full bath and one 1/2 bath. There are double sliding glass doors off of the bedroom and living room to the balconies which provides for a light filled unit. The balconies can be enjoyed all day long as they are sheltered from the afternoon sun and there are cooling tropical breezes. Set on seven and one-half acres of waterfront property on Simpson Bay Lagoon, the AquaMarina Community is a luxury complex with 24 hour security, a complete gym and sauna, pool and a free water taxi into Marigot. It is a beautifully landscaped property conveniently located on the Dutch side in a quiet and tranquil location. Beaches, casinos and restaurants as well as a golf course are just minutes away. To experience the French culture, a drive to the capital, Marigot, is 10 minutes (or alternately you can take the free water taxi). Philipsburg is a 15 minute drive where you can take advantage of the duty-free shopping. Views of the Atlantic Ocean, Simpson Bay and the Caribbean Sea. Parking spaces within secured area. This was our third vacation in St. Maarten and the first at AquaMarina. The unit and grounds are as advertised; just bring your swim suit and sun glasses as Bruce & Joyce have equipped the unit with everything you need!!! We will definitely be staying here on our next visit to the island and recommend to all couples looking for a quiet place to relax while still being close to the beaches & restaurants. We are so happy that you enjoyed your stay. Vacation time is very important to us so we do everything possible to ensure that our guests enjoy themselves. We look forward to your return stay. This was the fifth consecutive year my wife and I have spent multiple weeks in this condo in the gated community AquaMarina near Maho, Cupecoy, the French side of the island as well as all the activities and restaurants in Simpson Bay. The condo is the perfect size for two people. The kitchen has just been remodeled and now has a dishwasher and other upgrades. We have always found the washer and dryer to be very beneficial as well. Bruce and Joyce do a great job maintaining their property and have always been very attentive to any of our needs. The on-site property manager Robert works closely with the owners to address any immediate needs. This property is under 24 hour security protection. We have always felt safe during our stays. We plan to spend multiple weeks again next year in this condo and can heartily recommend that couples consider staying here while vacationing on Sint Maarten. Thanks for taking the time to write a great review. We look forward to having you as our guests again next year. My wife and I have visited St. Martin (7) years in a row. This is the 1st time we have stayed with Bruce and Joyce. We are glad to say we have found a place that we will return to next year and many years after that. We had a wonderful time and a perfect stay. No longer will we be searching for a place to stay. This place is "perfect". Thank you for your excellent review. We are fortunate to have such wonderful guests and we look forward to hosting you in the future. Thank you for allowing us to rent your Condo in Sint Maartens. From the first E mail it felt like I was dealing with my next door neighbour. Everything was as described in your rental advertisement. Your person, on the island, Robert, was always quick to answer any E mails or questions. The unit is well stocked with necessary items like beach chairs, umbrella, towels for beach, and the Wi-Fi worked great. Kitchen, we were happy to find all the spices and oils. We like to entertain ourselves with a nice meal and good bottle of wine. This was very easy for us. Having a 5th floor unit we felt very comfortable and having a nice gentleman like Terry at the gate to see you in and out was reassuring. You and Joyce are a fine couple to deal with and we have no problem recommending your unit. Thank you for taking the time to write such a thoughtful review. It is important to us that our guests have a great holiday when staying at our condo. We want our guests to have everything they need so they can relax and enjoy what the beautiful island of St. Maarten has to offer. Having our own concierge, Robert, who is there to assist guests is important because we want our guests to have a worry free stay. We also want our guests to feel this is their "home away from home". Thanks again. We appreciated having the opportunity to host you and we look forward to your next visit. This was our 9th time to St. Maarten and our first time to stay at AquaMarina. The condo was perfect. Beautiful views and was very well stocked with everything we needed for our stay. We prefer to stay in condos when we travel so we can have the option to cook on occasion rather than eat out. However, we have found that sometimes the condos aren't as well equipped with kitchen utensils, appliances, etc. as we would like. This is such not the case with this condo. Bruce and Joyce have put such detail into making their condo a home away from home. It is beautifully furnished. The bed was very comfortable. We thoroughly enjoyed using the hurricane shutters at night to keep out the morning sun. This was our first time to stay on the lagoon side and I have to say we preferred it because there is so much more to see from the balconies - and taking a stroll down to the Marina was lovely. The AquaMarina complex itself is very private and peaceful. We would definitely stay there again. Lastly, Bruce and Joyce are very attentive owners. They were always available to answer any questions we had, etc. The tip sheets regarding the condo that they send you before you leave (and are also there at the condo) were very helpful. Thanks again for having us! We hope to be back again soon! Third stay here and it's still perfect. I am a regular visitor to SXM and consider myself very fortunate to have stayed here three times now. I know that myself and previous reviewers have stated over and over how great this place is, but it can't hurt to mention it again...especially if it's true! From the moment you arrive, it just feels like home. The unit is spotless, the furnishings are modern, tasteful, and comfortable, the kitchen has everything you could need, and having your own washer and dryer is a major plus! Also provided for your use are beach chairs, a cooler, beach towels, and umbrella. 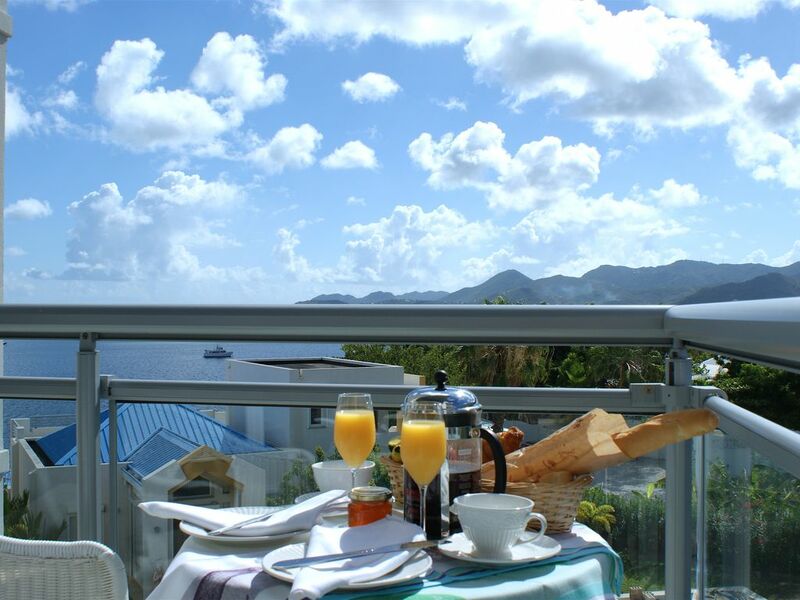 The fantastic view and refreshing breezes make the balconies the perfect place for your morning coffee. The location is very quiet and secure, yet close to everything the island has to offer. Beaches, grocery stores, restaurants, clubs, bars, etc are all just a couple minutes away. On top of the condo itself being great, Bruce and Joyce are absolutely fantastic to work with. All communication is friendly and prompt, no question goes unanswered, and you'll feel like you are renting from a friend! Thank you again Bruce, Joyce, and Robert! Thanks for such a nice review. We are always happy when our guests enjoy their stay at our home as much as we do.